Are you looking for a FREE and easy way to reflect on the Solar Eclipse? Wondering how to get the idea of how Primary and Secondary Sources work? This blog post is just what you need! Students really struggle with the idea of Primary and Secondary Sources because they think it doesn't apply to them! When a key event occurs, like the Solar Eclipse of 2017, we can apply this very topic to the skills we need to teach! Here's how it works! First, grab this FREEBIE from my store! It is a Print-and-Go activity. For younger kids, use the guided questions. For older kids, you can use the more advanced version of the planner and writing paper to have a complete essay written about their experience. 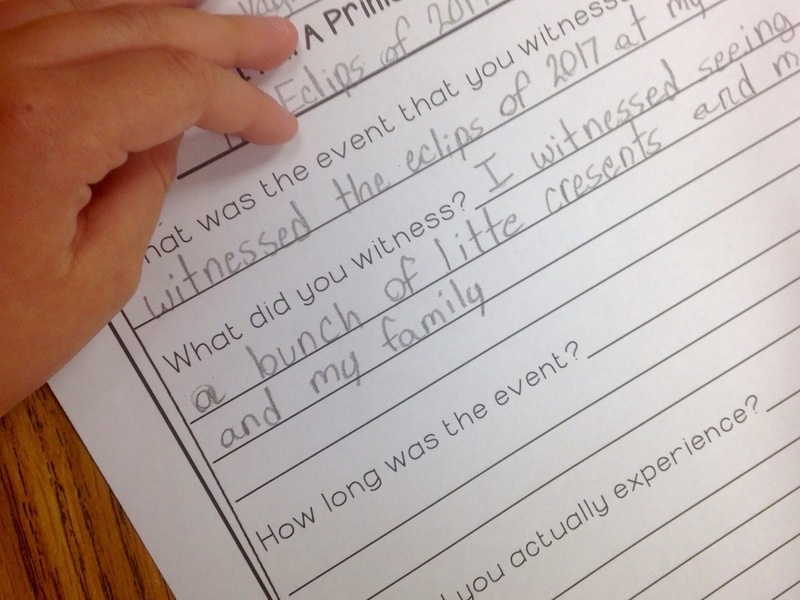 Explain to them that they are now a primary source for the eclipse! They will remember this moment forever and will talk about it for years to come! I always tell them that when they grow up, they will talk about this with their friends and then their kids will ask about it! That is met with "EWWWW!" so it is always a fun moment! I also explain that newspaper article, videos, and pictures are also primary sources-including those taken during the eclipse! Second, grab a Secondary Source. This ONE is from Time Magazine and it covers what was done in the 1960's for the eclipse. Many of the activities in the article are the same ways that we prepared and watched the eclipse this year! How cool is that! Be sure to look through the pictures and show them to kids! They are a hoot! The nice thing about this particular article is that it clearly shows how it is a secondary source. First, it talks about our eclipse. Next, it jumps back in time to the eclipse of the 1960's. In addition to that, it had a direct quote from the original article. This makes it super easy to explain how it is a secondary source! Easy, peasy!! Then, work with the students to complete the question in the Freebie. Students should be encouraged to share their excitement and/or their disappointments. (We couldn't bring our students outside but many of them were picked up from school to view the eclipse.) This also gets them talking about their experiences! I heard things like, "I was swimming in my pool with my fun glasses on watching the eclipse!" Yep, true story! Anyways, this is always a great way to quickly share without everyone having to go into detail in a large group setting! Finally, mount these two next to each other so that students can see a primary and secondary source document next to each other. I have them also label each document so they know which is which! Super quick and super easy! They also look great hanging in the hallway! Other students have fun checking out what other have posted! I hope you enjoy using this product! 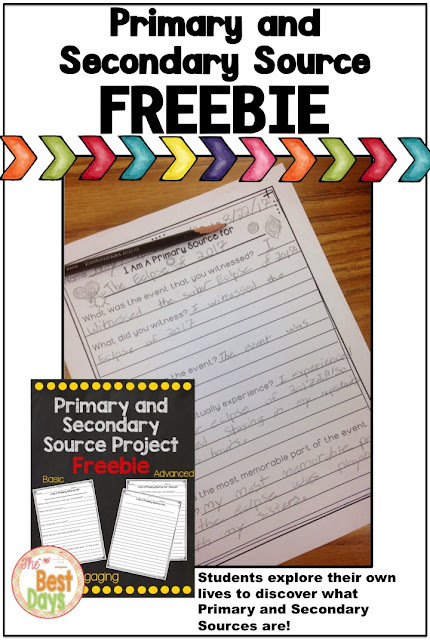 It is always FREE in my store and can be used with any event across the school year. While you are there, click the green star to follow me for more great products!